There are smart ways to run a marathon. And then there’s the way I did it. There are two things runners fear most in the week leading into a big race – sickness and being hit by a bus. Thankfully I live in a semi-rural area with no public transportation, so the bus encounter probability was fairly minimal. Sickness, on the other hand, was far too likely for my pre-race comfort. Just in time for race day, a plague of viral infections had swept Northeast Ohio. Clevelanders were coming down with high fevers, lethargy and general feelings of bodily nastiness. It was like a scene from The Stand – every time I turned around another coworker, neighbor or friend was infected. So I did what every rational runner would do – I avoided all human contact for the week preceding the race. I hid in my office at work so not to catch their sickly germs over the water cooler. I avoided any in-person social interaction and stuck to the old standby’s – Facebook and email – to communicate with family and friends. When I was forced to go into public areas such as the grocery store, I chose the self-checkout lane to avoid the air propulsion of the overly chatty cashiers. My sons, who I previously coined the “germ monsters”, were another obstacle to deal with. While they had yet to show signs of impending viral doom, I knew they hung out with a questionable crowd – all those toddlers and preschoolers and their sippy cup sharing, toy slobbering, and other lewd acts. I ended up taking a firm stance – absolutely no sneaking sips from mom’s water bottle and absolutely no mooching off my dinner plate. For one week they would just have to use their own cutlery and eat their own food. I am happy to report that my last stand against the plague was successful as I escaped the week unscathed. The reception was on Friday night, and Vince was my ever handsome date for the evening. At the soirée, I got a chance to meet some of the other winners. Each and every one of them had a compelling and amazing story to share. There was the daughter who devised a diet and exercise plan for her obese father, leading him to lose over 100 pounds in ten months. There was the man who unknowingly experienced a heart attack during last year’s race. Not realizing the severity of his condition, he continued, finished the race and returned home to watch the Browns game. There was the woman who was running her very first half marathon race as a tribute to her deceased brother, a former wheelchair competitor. However, the one that touched me the most was a woman named Cindy. Only a month before, Cindy’s husband, a pilot, had died in a tragic plane crash. Despite the circumstances, Cindy did not abandon her dream to run the Columbus Marathon. For most of the honorees, including myself, our impending marathon was a celebration of the completion of a long and grueling journey. Cindy, on the other hand, was just starting out on her own journey. Although our circumstances are completely different, I remember vividly how unnerving the initial stages of shock and uncertainty are. This race was just the first obstacle of many that she would face on her long road to healing. It was a powerful reminder, on the eve of my victory lap marathon, of how it began just twenty months ago. On Saturday, our family of four (plus Grandma and Grandpa) headed to the kid’s “Red Nose Run” held at a local park. While the competitor in me was anxious to see if the Fontana endurance genes had been passed on to our boys, I knew they were only interested in one thing – the snack selection at the finish line. This would be Porter’s first race – the prestigious and highly competitive “Diaper Dash”. As I sized up his pint-sized competition, I figured he had a decent chance of a strong showing. Of course, there were a few ringers in there – a few toddlers much too tall and coordinated for age two. I considered demanding birth certificates and performance enhancing drug testing but the clown, er race official, had already sounded the goofy sounding horn, er starter’s pistol. Unfortunately, Porter experienced an equipment malfunction that hindered his normally lightning quick start. All of sudden his race number, which hours earlier he proudly adorned, was now completely and totally unacceptable. Porter refused to take a step forward until that thing was removed from his chest. So I hastily unpinned the number, and a relieved Porter finally joined the race. It was a hard fought race filled with focused competitors (focused on picking their noses, focused on looking at birds in the sky, focused on pretty much everything except running). Porter gave it his all. With his pronounced Buddha baby belly and jerky movements he more closely resembled a middle-aged man running for the fridge than an Olympian headed towards the finish line. I had never been more proud. After the epic length endurance event, er 100 meters, Porter triumphantly crossed the finish line and received his medal from the clown, er race official. Unlike the race number, he wore his medal with pride. Once the Diaper Dash was complete, we hastily made our way to the finish line for the older kid’s races. We go there just in time so to see Dominic sprint towards the finish line. Dominic, like every other preschooler in the race, had started the race in all out sprinting mode. There’s no such thing pacing yourself when you are four years old. The only race strategy that exists in their universe is running as hard as you can for as long as you can. The unfortunate downside to this philosophy is that is unsustainable for all but the most athletic of kids. From our vantage point near the finish line, we saw many, many kids fall prey to the all out methodology. Kids who undoubtedly started the race with leaping strides and pumping arms were reduced to a forced shuffle in the final meters. From the neck down, you could tell these kids were TIRED. But neck up, there was no indication of anything but complete joy. They had poured everything they had into the race and were riding a thrilling high for doing so. But I do know Dominic finished with a smile on his face, having experienced the rush of giving his all. After he crossed the finish line and received his medal, we hit the highly anticipated post-race refreshments. My boys took post-race refueling and hydration very seriously, collectively devouring several glasses of Gatorade, half a loaf of banana bread, and a bushel of fruit in a matter of a few minutes. With the calorie replacement complete, we headed home as a happy family with great memories, with chests proudly displaying hard earned Red Nose Run medals, and with bellies sloshing around with performance drink. The next day, Sunday, was the day I had been waiting and waiting and waiting for – race day. I set out in the race to do two things (a) run as fast I can (b) qualify for the Boston Marathon. The Boston Marathon is the gold standard of marathoning. There are other races more competitive (i.e. The Olympics), and there are other races with bigger fields (i.e. New York City). But there is only one Boston Marathon. Its history contributes much to its mystique. Over one hundred years ago ten runners toed the line and ever since the best of the best have made the 26.2-mile trek from Hopkinton to Boston. Olympians, World Record Holders and mere mortals alike all have kissed the coeds in Wellesley, hammered Heartbreak Hill, and celebrated down Boylston Street on the epic course. But even more so, its prestige defines its mystique. The Boston Marathon is the only major marathon to have qualifying standards. Based on age and gender, these standards become ingrained in every runner’s gray matter just about the time they catch the running bug. Some people get the Boston Qualifier first time out, and others try their entire lives for it. But no matter how many attempts it took acquire, anyone who obtains the “BQ” cherishes it. I had it once before, pre-cancer. And I wanted one again, post-cancer. For women of my age, the Boston qualifying standard is 3:40. Based on my training, I knew 3:40 was very feasible. Especially if I took it conservatively and tucked in at 3:40 pace for the entire race distance. In a former life, I would have done just that. But as much as I wanted a BQ, I also wanted to run as fast as I possibly could. I wasn’t about to play it safe just to ensure a spot in Boston. Playing it safe would be a slap in the face to everything I learned and experienced this past year and a half. So I set a pretty aggressive, and risky, time goal. I wanted to run 3:20 pace, 7:37 per mile, as long as I possibly could. Thanks to a lot of successful speed workouts, my tune up races indicated that I was capable of anything between a 3:10 and 3:20 marathon. But I knew my endurance wasn’t quite up to par. The conventional wisdom is that you spend at least one year building a distance base before even attempting marathon training. I, of course, spent the base building year hobbling on crutches, tackling chemotherapy and enduring radiation. When I did get the go ahead to run, it took me five months just to progress from wogging (walk/jogging) to anything remotely resembling running. When I did start full-fledged marathon training, my subsequent long runs were marginal at best. I spent the final miles of pretty much every long training run in complete survival mode. As I waited for the gun to fire on race day, I knew I had a long, hard battle before me. The first few miles were chaotic, as I navigated the crush of runners around me. Anxiety about the task on hand forced my heart to race and my breathing to labor, even though the pace was less than taxing. Eventually, thanks to repeated self-affirmations that would make a motivational speaker proud, I was able to eventually calm myself down and find my rhythm. About this time I spotted the Governor of Ohio cheering alongside the race course. Well, I think it was him. In all honesty, I’m not really sure what our state’s leader looks like, probably to the dismay of his re-election committee who has been running endless ads on my television set. Anyways, I saw an overly dressed man with police escorts standing near the governor’s mansion, who may or may not have been the Governor. Miles five through ten were largely uneventful. My cancer leg was acting a bit hokey but nothing to prevent me from remaining on pace. In general, I felt ok, not fantastic, not great, but ok.
It’s when the mileage counter hit double digits that things started getting a little rocky. For the first time all day, I felt like I had to do some work. I wanted to keep the pace and knew I could at least for a few more miles, so I dug in and really concentrated on putting one foot in front of the other. Again and again. Up to this point, the race consisted of both half and full marathoners sharing the same course. But at mile twelve, the half marathoners diverged on their way to the finish line. Those doing only 13.1 would be enjoying post-race treats and the comfort of dry clothes in just a few short minutes. I, on the other hand, had almost two more hours to go before I could experience such luxuries. It was easily the lowest point of my race. But I resisted the urge to cut the race short and soldiered on. My fresh legs were getting heavier and heavier with every footfall. And then at mile sixteen, they just gave out. It was a frustrating feeling, knowing that you have plenty of stamina and energy but your legs could take you no further. And it was a frightening feeling, for I still had ten long miles ahead of me. It was going to be a very long day. But I kept going. One foot in front of another. Again and again. The miles accumulated, and so did the heaviness in my legs and the fatigue to my psyche. As it did, my pace began to erode away. At first, it was just a trickle. A few seconds over pace here, ten seconds over pace there. And then the trickling turned into gushing. Thirty seconds over, then a minute over. Before I knew it I was running almost two minutes over my target pace of 7:40. I tried everything to get back on track. Walk breaks. Massaging my legs. Pouring so much water on my lower half that I looked like I had peed myself. If someone had come along and offered me magic running beans for a million dollars, I would probably have taken it. But there was nothing I could do. My legs were completely burned out. Somehow, someway, I just had to get to the damn finish line. One foot in front of another. Again and again. With about 5K to go, I spotted my friend Lisa and her family. Her appearance could not have come at a more opportune time, as both my body and mind were on the verge of collapse. I was training to run the Flying Pig Marathon with her when I was diagnosed, so it was completely fitting when she jumped into my first post-cancer marathon and started to run alongside. Although my decaying brain function allowed me to decipher approximately 25% of her words, what I was able to hear was encouraging and uplifting. But then, with no warning, she veered off course and left me. I would come to find out later that a runner near me had collapsed to the ground. Lisa, a nurse, was the only medical professional around. She rushed to his side where she found him unresponsive. Eventually, they had to call an emergency squad. I only found this all out when I called her post-race, and she apologized profusely for not running with me longer. Not only does she haul her newborn son and two toddler daughters early in the morning to support me, but she also jumps in the race to pace me on. And just for good measure, she supplies medical assistance to an ailing runner. Can you say, superwoman? After I had left Lisa to her life-saving duties, I trudged on towards the finish line. I knew I was going to be close to getting a BQ, but I just wasn’t sure how close. Every mile along the course is marked with a banner and a time clock indicating overall race time. But it’s based on the time the gun sounded, not the actual time you crossed the starting line. I wasn’t sure how long it took me to cross the starting line, but I guessed it was anywhere between thirty seconds and a minute. So I had to factor in this variable in my minutes left divided by miles left calculations. Trying to do math while running is hard. Trying to do math when your brain shut off somewhere around mile 18 is akin to solving differential equations with an abacus. So I spent a better part of the final miles trying to figure out what pace I needed to sneak in under 3:40. A high school friend apparently was on the course around mile 24, screaming my name and trying to get my attention. I did not see her. She would later tell me I looked like I was focused on running. No, Laura, I was just really focused on trying to do math in my head. My fuzzy math had me needing to attain ten-minute miles for the remainder of the course. On a normal day, ten minutes per mile would be a cake walk. On this day, it seemed like a feat of Kenyan proportions. It seemed impossible. Rounding the 25-mile mark, I knew I would be able to squeak in under the Boston Qualifying standard as long as I stayed in forward motion. Easier said than done. The only thing I had left was pure will. So that’s what I used. One foot in front of another. Again and again. Merciful people, the race directors plotted the course so that the final meters were on a steep downhill. Which meant (a) I could gain further time over the BQ standard (B) I wouldn’t be captured crawling across the line in by finish line photograph. And with that, I crossed the finish line. 3:38:02. 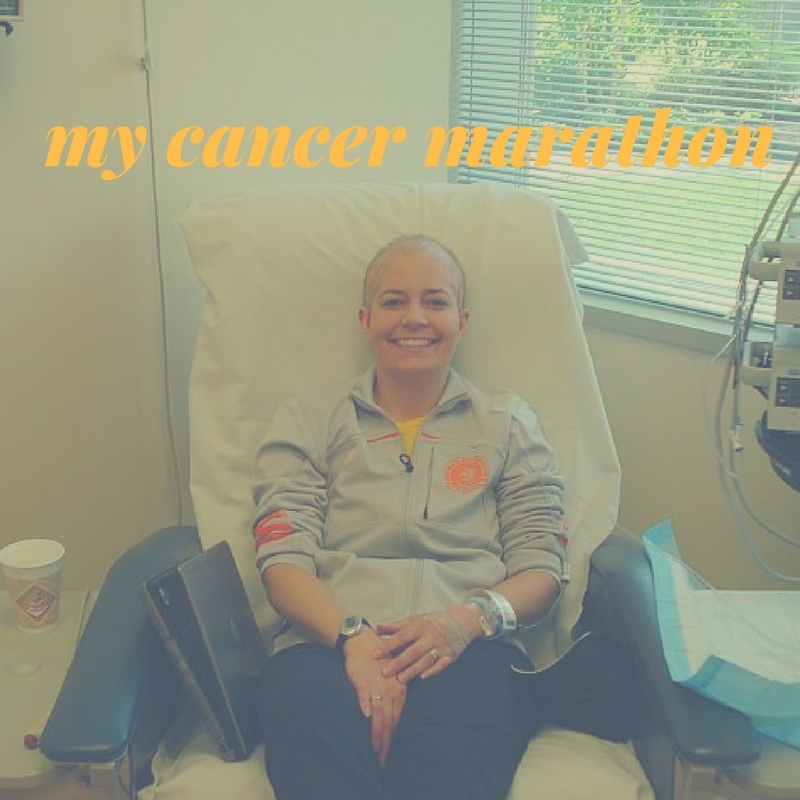 A year and a half after discovering my leg was ravaged by cancer, I had not only run 26.2 miles but had qualified for the Boston Marathon. A dream I once thought was forever lost. Sobbing ensued, fueled by utter amazement and complete exhaustion. Apparently, my tears of extreme exuberance closely resembled sobs of extreme pain, as I had three different volunteers ask if I needed medical assistance. Eventually, I composed myself to claim my medal and to take one overly happy finish line photo. Vince finished not long after me, in 3:45. It was an amazing time for a debut marathon, not even factoring in his lack of training. He had to forgo his own marathon aspirations when I got sick, so it was wonderful to be able complete our marathon journeys together. We concluded the race in a way that would make our sons proud – by savaging the post race refreshments. Bagel anyone? Running a marathon as fast as you can until you die is not smart. And really it’s painful too. I do not recommend trying this at home. But if I had to do it all over again, I would have run the race the exact same way. It was completely thrilling to cross the finish line knowing I had not one more ounce to give the race. It’s way more fun to give it your all than to play it safe – something the tots in the Red Nose Run know well, but us grownups seem to forget. I’ve been struggling with how to finish my final post. I just couldn’t find the right words to summarize the last year and a half of cancer treatments and marathon training. I sat in front of the blank computer screen, waiting impatiently for something monumental to come to mind. But as my frustration grew, so did my clarity. I couldn’t conclude my story with allusions to chemotherapy and radiation, to mile repeats or marathon finishes. Because in the end in never was about cancer. And it was never about running. Instead, it was about taking on the scary, the unknown, the seemingly impossible. Battling or enduring, as the situation warranted. And coming out on the other side, doing more and being more than you ever thought possible. I don’t know what my next metaphorical marathon is. It may involve running; it may not. And I pray it does not involve cancer. Whatever the challenge is, I’ll embrace it one step at a time. I look forward to the miles ahead.